The Campus Crossroads Project at the University of Notre Dame boldly wraps the iconic 1930's Notre Dame Football Stadium with three new buildings, including over 750,000 SF of student life space for recreation, academia, and performance. While such varied programs could have been merely co-located, the design team found programmatic synergies that bring a sense of unity among the parts. The new Duncan Student Center includes a main level of varied dining environments, active lounges, and an inviting coffee house/programming venue. A second level for student media groups, meeting rooms, and offices for Housing and Graduate Life all overlook active social spaces below. These are interwoven with two Rec Sports levels above, creating four levels of the most social and active student zones in the development. 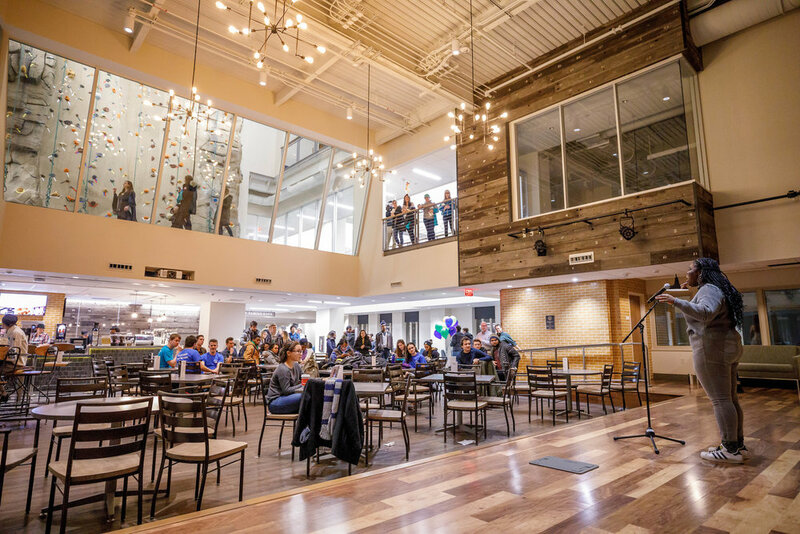 A three-level climbing wall rises prominently from the second level of the coffee house up through the Rec Sports levels, emerging as a physical and symbolic link between the student union and recreation sports levels. Openings between floors allow a suspended running track and the climbing wall to be visible from the main level entrance, enticing students to explore recreation activities above. Innovative media spaces for student organizations focus on print, television, and radio while bringing those groups together in a convergence of platforms and creative talent, infusing the Student Center with a forward-thinking, interactive media culture. At the same time, the design invites all ND students into the media spaces to explore interactive technology and get involved. On game days, the Student Center will transform to accommodate the needs of a broader audience.